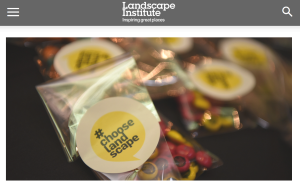 Award-winning garden designer, landscape architect and newly appointed President of The Landscape Institute, Adam White, has launched a new campaign to promote the range of career choices and opportunities in the landscape profession. Adam announced the #ChooseLandscape campaign at a packed reception at the Garden Museum in Lambeth, where he accepted the LI Presidency from Merrick Denton-Thompson. The landscape profession has a huge impact on lives and communities. It has grown by nearly 16% since 2010 and contributed nearly £1 billion to the UK economy. The LI’s new report, the Future State of Landscape, highlights an urgent skills shortage in the landscape profession. Adam White said: ‘Good landscape plays such an important role in all of our lives. It’s where people, place and nature connect. It makes us feel good, improving our well-being through better planned greener cities and open spaces. But the nature neurons in our brains are flatlining as we become less and less connected to nature and there are some pretty big challenges ahead as our cities continue to grow and the environment comes under more pressure.